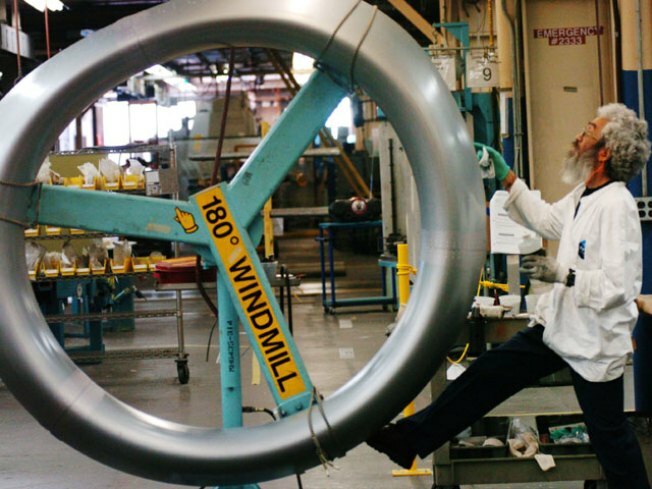 Worker Cliff Imada rotates a 737 jet engine nose component at the Goodrich Corporation plant February 28, 2005 in Chula Vista, California. The dismal economy and its impact on the job market had many “Your Career” readers fired up this year. As a result, columns on everything from furloughs to empathy when laying workers off were among the most popular in 2009. That’s not to say non-economy stories didn’t get your attention as well. A column on David Letterman’s dalliances with subordinates and one on whether you should give two weeks’ notice also got some strong reactions. Furloughs were such a hot issue this year that I ended up writing two columns and endless blog posts on the topic. In a rush to cut costs during the recession, many employers engaged in a furlough frenzy, sending workers home for days and sometimes weeks without pay. Unfortunately, worker rights seemed to also get lost in the shuffle. Workplace experts said the furlough craze among major companies such as Dell Inc., Gannett Co., American Airlines Inc. and Du Pont, just to name a few, was creating a type of “Wild, Wild West” with little regard to their impact on worker productivity or morale. My salary COLA was 5.2 percent. However, the forced furlough will cost me 4.2 percent of my salary, which therefore means my buying power is down 5.2 percent. So the raise is nil. I am treading water. My parents were Depression kids and taught me well about saving. I am also given the comment, "at least you have a job," but what I fear is that due to reckless spending by our local government, this option will be used again in the future as a way to cut losses due to poor fiscal management. Just another way for government and big business to screw the middle- and lower-class people. Maybe we should "take a furlough" on paying taxes. If an employer doesn't have enough money to pay his/her employees, they have to do something about it. So exactly what would you whiners suggest? Most business owners are not rich, and no employer can act as irresponsibly as our federal government and just keep printing and borrowing money. Empathy can go a long way at the officeEven though layoffs seemed to be a way of life this past year, many workplace experts wondered if there wasn’t a better way to handle cutbacks at work. Is it a bad or good thing to show some empathy at work? Even Sonia Sotomayor, the newest Supreme Court justice, came under fire for being empathetic. Many management experts concluded that the best organizations tend to have a culture that encourages empathy. I almost laughed out loud when I read this. My experience where I work is that management is encouraged to be the opposite of empathetic. Don't let the work force know that you (or they) are human. That would show weakness. Let's let our pride run us aground like GM, AIG, etc. It looks more to me that we're heading back to the Frederick Taylor 1900s rather than towards a way of positively motivating people. Does being shot in a nice and empathetic way make it more survivable? Sugar-coated bullets less deadly? Employers digging deep on prospective workersThe recession brought with it guerrilla reference-checking tactics, where hiring managers go to great lengths to dig up dirt on you. With the explosion of social networking sites, it’s easier than ever for employers to find out information about you and connect with your old bosses and colleagues even if you don’t want them to. I really don't think these companies are getting the best employees — they are only getting employees who can play their game the best, which might include the occasional sociopath and more than a few workers with borderline personality disorders. To beat their hiring practices requires a potential employee with the same amount of paranoia, skullduggery and sleight-of-hand the companies themselves are engaging in. If these are the types they want working for them, more power to them. They deserve each other. Take this job and shove it! With loyalty in the workplace considered passé, many readers started asking me if it was OK to just leave a job the minute they got a new offer. The practice of giving two weeks' notice has always been the norm in almost every job. But given what employees have been asked to endure this year, including everything from pay cuts and increased workloads, few workers feel compelled to offer their employers such a courtesy. The overall thinking among workplace experts, however, is never burn your bridges. I find it amazing that employers are shocked that employees aren't giving two weeks' notice when companies for years now haven't given employees the same respect of time when being laid off. How often have we heard (seen) the following scenario: Employee goes to work one day as usual and employer taps employee on the shoulder and tells employee that his/her job has been eliminated and employer escorts employee THAT moment out the door. No two weeks' notice here. And that is OK? But employees not giving notice isn't? I'm sorry but respect is a two-way street. I find it ironic if not hilarious that employers quite honestly have the (gall) to complain when I've seen married, single-income families shown the door with two or three minutes to spare to clean out their desks ... all for no other reason than to save on the bottom line. David Letterman’s confession that he acted “creepy” by sleeping with his underlings at work sparked a firestorm of debate throughout the country. Romance in the workplace is nothing new. But when a manager admits to having sexual relations with more than one subordinate, it could create a hostile work environment and lead to allegations of sexual harassment. I agree with your caution to those individuals in or considering a workplace romance. The results tend to be disastrous for both parties. However, I believe Letterman handled it in a most appropriate manner. I hope the information provides substantive material to be considered before embarking on such a dangerous liaison. It is less than disingenuous to believe the women involved in these affairs did not feel some sort of pressure to “sleep with the boss.” In this case, working for a media company, one would even be more reticent to complain about the affair as being harassment because you would never have work in that industry again if you took down a star like Letterman. Letterman did knowingly create a hostile workplace, which it appears he used for his romps. Never mind he got married in March of this year. It shows me that sexual harassment is very alive and well in the workplace.